Published in Rafu Shimpo, December 19, 1967, Japanese section and December 20, 1967, English section. Crown City Optimist International Club dinner honoring Issei pioneers at Man Jen Low restaurant in old Chinatown, Los Angeles, Calfiornia, December 18, 1967. 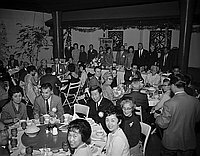 Large group of Japanese and Caucasian people dining at tables with eleven people standing at head table. Optimist International banner hands behind head table below garlands. Japanese Consul General Toshiro Shimanouchi stands fourth from left. Typed on original envelope: Optimist -- Not JA Optimist.